Okay, can I just brag for a moment? This June, we will celebrate nineteen years of marriage! Whew! Time flies. It really does. Has it all been wedded bliss? Not hardly. Our journey has been replete with ups and downs, joys and sorrows, victories and valleys…just like most. Our secret? God has been at the center of our relationship from the very beginning, and, how we’ve relied on Him to see us through! We would have failed miserably if we rested on our own strength, but thank God for His mercy. His never ending grace has not forsaken us. 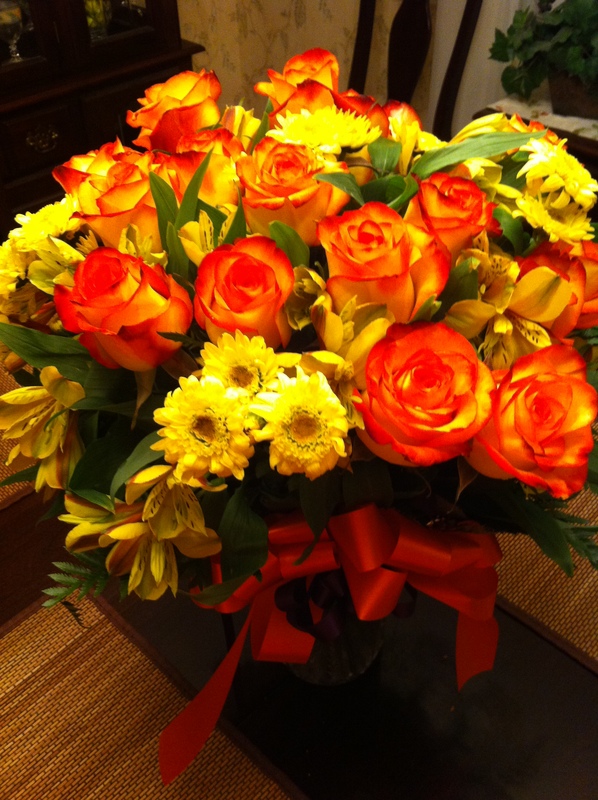 He brings me flowers, sometimes for no reason at all. Is he perfect? No, but he’s perfect for me! God brought him from half way around the world just for me, and I am ever grateful for that! When we’re apart, I’m looking forward to our reunion. When we’re together, I am at peace. He completes me and we complement one another. He is my best friend. I know I can confide in him. He holds my deepest trust and I am secure in his love. We’ve been through many difficult and challenging seasons together and our love is richer for it. Young love is a many splendored thing, for sure. However, mature love, love that has endured decades, has a depth that is gratifying and fulfilling like no other. He loves to sing and we often enjoy singing together. In the quiet times, his melodious voice soothes my soul. My husband strives to do things that he knows will bring me happiness. He really tries to please me…and I him. That’s what love does. Just to “keep it real” … When we’ve argued, he forgives me and I forgive him. We don’t keep score. Love doesn’t attempt to change what it cannot. It accepts and keeps rolling on. I think that’s one of the greatest keys to a happy marriage. He captured my heart twenty years ago and holds it still. …Thanks for indulging me to brag on my husband for a minute. “My beloved friends, let us continue to love each other since love comes from God. Everyone who loves is born of God and experiences a relationship with God. The person who refuses to love doesn’t know the first thing about God, because God is love—so you can’t know him if you don’t love. This is how God showed his love for us: God sent his only Son into the world so we might live through him. This is the kind of love we are talking about—not that we once upon a time loved God, but that he loved us and sent his Son as a sacrifice to clear away our sins and the damage they’ve done to our relationship with God. 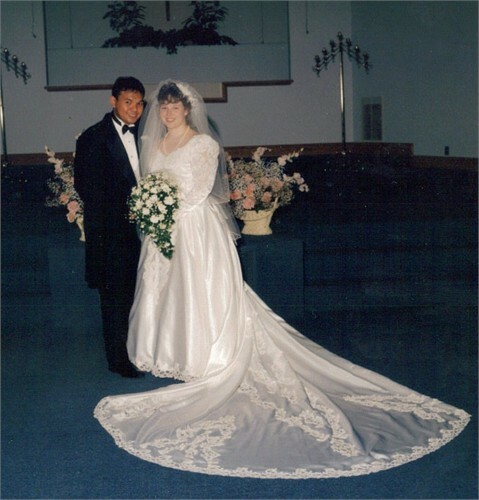 My wonderful husband hails from the Philippines and we will celebrate 19 years of marriage this coming June. Woo Hoo!! When he came to America over 25 years ago, he knew a little English, but not much. Probably about as much Spanish as I recall from school, muy poco! He quickly learned the language through being immersed in the culture, though. Trial and error were his greatest teachers, I’m sure. When we met in 1994, he was very fluent in English, so I was reasonably confident we would speak the same language once we married. That was the first error in my thinking. The fact is that men and women think very differently! Men think in patterns of fact, reason and logic. Women think in patterns of feelings, emotions and illogic based on such feelings and emotions. (These are general statements, of course.) And, after a couple is married for some time, it seems one is supposed to have the super power of reading minds! These factors make for an interesting basis from which we are to convey our thoughts and make wise decisions. Communication is key to any relationship. I think we’d all agree on that fact. And, marriage is no exception. So, why is it that this important facet of our marriage is so difficult to attain? We are a distracted society! Between television, internet, cell phones, radio, work demands, financial pressures, the kids, and on and on it goes … There’s no wonder we find the task of communicating to be so daunting! There is a remedy, however. We must set aside a regular time to sit down, look our spouse in the eye and relate the things on our heart. One recommendation I read years ago was to establish a “couch time” when your husband comes home from work in the evening. This time is off limits to the kids for, say 15 minutes. (Depending on the ages of your children, this may or may not be feasible) I thought this was a good idea and we did try it for a while. Another important idea is to never stop dating your spouse! Complacency can easily set in and we need to freshen things up a bit. For us, we try to schedule a “Date Night” once a month, at least. Some months we are more successful than others, but that’s our goal. There’s something special about dressing up (even if it’s just a pair of jeans and a nice sweater) and being able to speak in complete sentences without interruption! That means no name calling, no “You always do this” or “You never do that”, or “I wish you could be like so-and-so’s husband”. Stick to the facts. All healthy relationships have conflict. And it is worth the effort to effectively convey your thoughts and feelings to broach difficult subjects. One illusion many people have is that they can change their spouse. Nothing could be further from the truth! God made each of us with a free will that is not easily swayed. The best remedy for lingering struggles is prayer. That may seem like a pat answer, but the truth remains. When we don’t have the answers, it is through prayer that we can ask God for breakthrough, wisdom and guidance. We invest our resources in many things over our lifetime. Our marriages are certainly worthy of investing our time, energy, understanding and affection. A godly marriage is one of the greatest relationships we can model before our children. It’s important for them to realize that despite conflict, love overcomes. Love wins! So, here’s to effective communicating! It requires hard work and much effort, but it will yield dividends out of this world! “Love is patient and kind. Love is not jealous or boastful or proud or rude.